The City of Portland is responsible for a large emergency response zone on the Columbia and Willamette rivers – nearly 150 miles of the rivers are under their care. 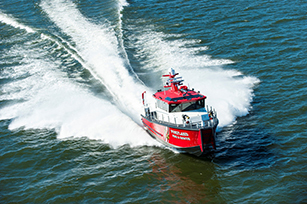 When the City needed new fireboats to keep the local industry and community safe, Oregon Iron Works and Pacific Power Group teamed up to supply the city with two fast-response vessels. Our marine division designed and engineered a complete propulsion solution which included the main engines, transmissions and drivelines for the boats to have critically-important high-performance fire-fighting capabilities. The vessels are powered by MTU 8V2000 M84 engines and Rolls-Royce FF450S waterjets, selected due to their known reliability and success in demanding marine environments. The new fireboats can travel up to 40 knots and respond significantly faster in the City’s large emergency response area. Both economical and revolutionary, Pacific’s solution supplies up to 8,000 gallons of water per minute through the water cannons without the addition of a dedicated fire pump engine (standard in typical fireboats). This allows cost savings due to the purchase of fewer engines and was engineered in-house for the City. Other new technological features include automatic compensation for the recoil from the water cannons and fully-integrated controls for fast and agile maneuvering.